What an absolutely amazing book! Is it possible that Erin E. Stead could win another Caldecott so soon? I could see an Honor for this book, definitely. 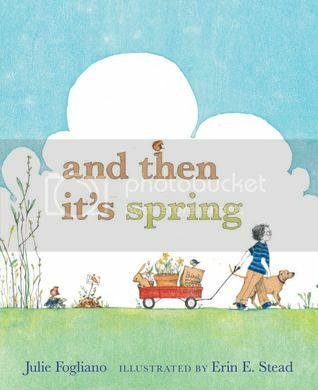 This story about hoping and waiting for spring begins by saying: "First you have brown. You have brown all around." "...but a hopeful, very possible sort of brown." "...and you worry about those little seeds." "...bears can't read signs that say things like 'please do not stomp here - there are seeds and they are trying.'" Well, isn't that the essence of spring, right there? There are seeds and they are trying. Astute readers will delight in little details revealed by the boy, his sleepy dog, pet bunny and pet turtle, including garden signs for a buried bone, and a chocolate chip cookie patch. Those mopsical bears just killed me! They carelessly knock down all the garden signs, but that doesn't stop those seeds from continuing to try, try and try. I like that this book doesn't end with a garden in full bloom but rather with the palest yellow green of early spring. When the first flush of new growth finally arrives, "...now you have green, all around you have green."